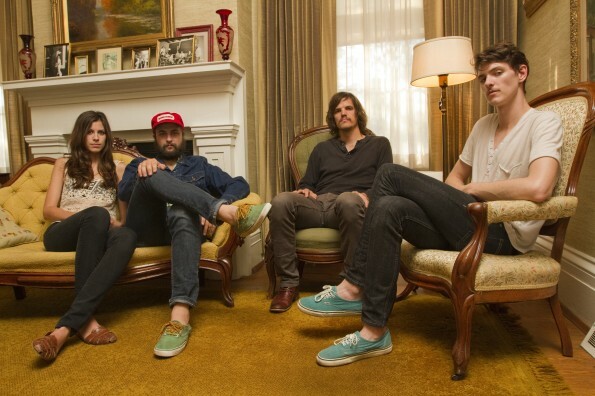 Houndmouth (Katie Toupin, Matt Myers, Shane Cody and Zak Appleby) has been riding a slow and steady wave into the somewhat saturated folk-rock-American-y scene over the course of the past year, and despite the fact that they may not be an indie-rockers’ household name yet, they may be soon. In the past year alone, they’ve gone from being an album-less quartet to touring the globe with Grace Potter, Alabama Shakes, Drive-By Truckers and playing on Conan. Oh, and they just released their full-length debut, From The Hills Below The City, two weeks ago and played Bonnaroo for the first time. They’ll also be playing Newport Folk Festival, Lollapalooza and Austin City Limits in the coming months. For a band that was relatively unknown this time last year, that’s a pretty strong track record for their first bona fide year on the musical map. “We didn’t expect anything really to come of it in the first place,” Katie says of the band itself, a young, scrawny group of twentysomethings floating in a haze of harmony-fueled ambition, talent and hard work. The group, from just outside of Louisville in New Albany, In., is more or less a ragtag team of buddies with a penchant for four part harmony and lyrical escapades that will make you drool. And so has the buzz they’ve created. The first time I heard Houndmouth was just around a year ago – when a friend shoved me in front of a computer and made me watch the group singing “Krampus” in what looked to be a crowded bar. We were both mesmerized, staring at the screen at this foursome. The sound seemed to be following along the folk-blazed trail romped by The Head and The Heart, The Lumineers, etc., but it had more power, more ache, more edge. 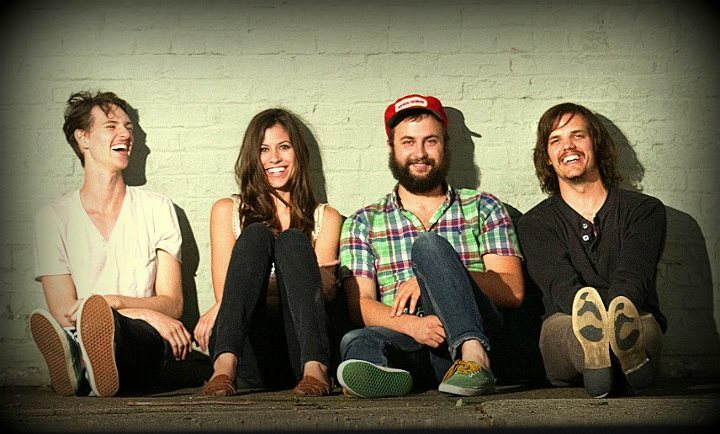 Katie’s voice soared and wailed instead of only providing distant background harmonies, and with all four of the group singing lead at some point, Houndmouth’s switch-up versatility was a breath of fresh air for a scene that seemed to keep producing the same song over and over again. And yet, there’s something just familiar enough about this group. Maybe it’s because a lot of their favorite music is from decades past; right now, they’re likely in a green room somewhere listening to Van Morrison’s Moondance and dreaming of sharing a studio with Richard Manuel, Levon Helm or Otis Redding. These influences have served them well—allowing the group to range from catchy, folk ballads to lengthy stories with twisting plots. Some songs on the record resonate a heartfelt simplicity (“Krampus”), some feel like a drug-fueled legend (“Houston Train”) and some sound as rugged as the southern rock they were bred in (“Penitentiary”). They also all sing—whether it’s lead or harmony, and you’d be surprised at how well each of them is able to be the frontman or woman. Live, the group feels cohesive, youthful and excited, with smiles flashing across the stage or subtle head nods when the perfect harmony is hit. It’s a flow that works naturally for Houndmouth, who are a young, scrawny group of twentysomethings doing something they weren’t ever quite sure would work out. “If things don’t come together naturally, we don’t force them. That’s not to say some songs didn’t take a lot of practice. For instance, getting the build in “Palmyra” took time. Harmonies can sometimes be a challenge to work out too,” Katie says of the way the group writes and records. What’s probably not perfect, though? Holding down the estrogen levels in a group of all boys. To be fair, most musicians look as though showers are the last thing on their mind. And, for Houndmouth’s exhaustive tour schedule, I’m sure the prospect of cleanliness is hardly a top priority when you’re playing Bonnaroo one day and touring with Alabama Shakes four days later. In a lot of ways, the group has already achieved a lot of its musical dreams – playing notable historic venues like The Troubadour and Bowery Ballroom, and landing a late night slot that Toupin claims she was “so nervous” for that she barely even remembers it. And yet, their career has just begun. Only one year in and one album deep, Houndmouth still has a long way to the top of the world – even though it seems they’re already halfway there.